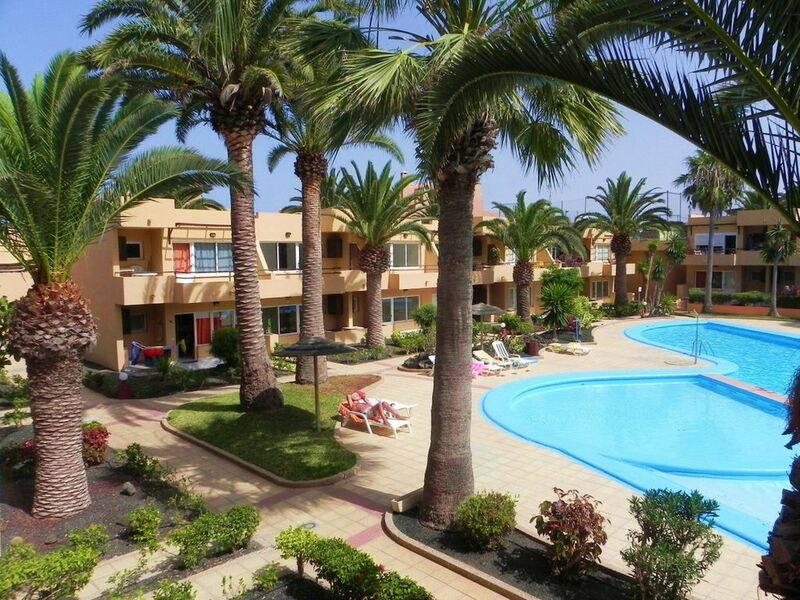 beautiful apartment in Corralejo, Fuerteventura, within a private complex, in front of the pool floor. The complex is super careful, has gardens with subtropical plants, swimming poolwith sun loungers and parasols, tennis and fitness for use by tenants and patio wifi free. New apartment and nicely furnished, has 1 double bedroom in the quietest area,bathroom with window, large mirror, hair dryer and 3 towels to person, fully equipped kitchen for 4 people and a washing machine, microwave, small appliances, iron andtable, living room with a comfortable sofa bed, flat screen satellite TV, ,from the large French window leads directly to its own terrace with table and chairsand private garden, overlooking the pool. A 300 mt from the Great Beach of Las Dunas. A 150 m from the shopping center "El Campanario" with supermarket, bar-restaurants, shops, taxi stand. 2 km from the Golf Course Park. A 10 minute walk, you reach the main street of Corralejo. Ideal one-bedroom apartment in a quiet complex with large pool. Easy 15 min walk to town centre, large supermarket within 5 - 10mins walk. Street parking but no problem finding spaces. Easy access to beach. Apartment very comfortable, plenty of storage space, well-equipped kitchen. Table and chairs available for sitting on patio. Provision of a few basic cleaning materials would be an asset. Overall we had a good experience with the accommodation. It was clean and as described. The reason for 4 STARS and not 5 is that the accommodation could benefit with basic toiletries such as toilet paper and hand wash, washing up liquid and sponges to wash the dishes, few bin bags and just basic things like that usually in the household. We had to buy our own to only use it for a week.. was slightly waste of money and we couldn't take it back with us all the way to UK so we left it there hopefully for new guests. We were also struggling with mosquitos during the nights. As there is no aircon or fan we had to leave all the windows open which allowed the mosquitos to enter (there was no nets on the windows apart from one in the kitchen.. so first few nights it was horrible and we couldn't sleep much but then we decided to buy a mosquito spray and spray ourselves at night but we were just sticky and hot as it didn't work much and we therefore slept with windows closed. I would suggest either air conditioning or nets on the windows to solve this issue. The owner were very nice and arrived on time. It was a walking distance to the sea and around 20 mins walk to the main touristic street which was a nice walk. Few supermarkets near by. Hi , is not sure that is old apartment , the furniture are new and usually the custumers are very happy . For the problem of paint on the roof outside and inside , we have a problem with the terrace upstair and when is resolved we must to paint . For the chairs outside , is sure are basic but we have a cuisin for the sit and iof you put have not a hot seat . We have doing a special price for you and same ckout late ( with- out payment ) but you put only 1 stars for a problem for a chairs outside and this is not aceptable . Not the first time we have stayed at this complex. The apartment was clean, well maintained & adequately equipped. Only two drawbacks: wifi is available in a communal area but not in the apartment and it would be nice if there was a luggage storage area in the event of one arriving early or departing late. That apart I would have no hesitation in recommending this property. The property was just as described. Clean and tidy on arrival. Everything we needed. Complex is very well maintained, pool area is very peaceful, not too busy. No loud music. Perfect environment for relaxing. We only had to wait 10 minutes, if that, for a very polite young lady, (she's a credit to Carla and Dario), to deliver our keys and show us to the apartment and make arrangements for her to collect the keys on departure day. True to her word she arrived exactly on time on departure day. Arrangement may differ for night-time arrivals/departures. We've been to Corralejo quite a few times before, but stayed closer to town, so it was good to explore this side of town, I would say it's approximately 15 minute walk from the main street, then onto the town beaches. There is a costal path, 5 minutes from complex, if you turn left along the costal path, stopping at a few watering-holes on the way of course, it's a little shorter. Turn right along it and you come to Coco Beach, much less populated. At night-time, the Campanario centre, more relaxed choice of eateries/bars, is a 5 minute walk away, if you want more a wider/livelier choice, then you can walk into town, or get a taxi from the Campanario, approx 3.50 Euros. Carla and Dario were extremely polite and efficient in the way they handled our booking, all aspects/queries of the booking were answered within a couple of hours. If you need a relaxing base just to chill or go off exploring, we would recommend. Just returned from a weeks stay and would not hesitate to recommend this apartment. Clean, modern and well equipped it was perfect for our requirements for a short break away from it all. The pool is a good size and there are plenty of sun loungers around. The terrace in front of the apartment overlooks the pool and is fantastic for enjoying a meal outside out of the blazing sun. The complex is located on the edge of town making it easy to find and also quite quiet. It is a short stroll to the beach and the nearest supermarket is a 5 minute walk. We enjoyed a great holiday here and hope to return soon. Water sports: windsurfing, surfing, kitesurfing, paddlesurf also optionally choosespecific courses per week. Sea excursions by catamaran, sailing, diving. Excursionsby bike, quad, karting, jeep safari. Beaches miles for lovers of sun, clear sea andwhite sandy beaches, and is frequently allowed to sunbathe freely without costume, a haven for naturists. In the evening many of the proposals: restaurants, bars with live music, theater anddance, bingo.